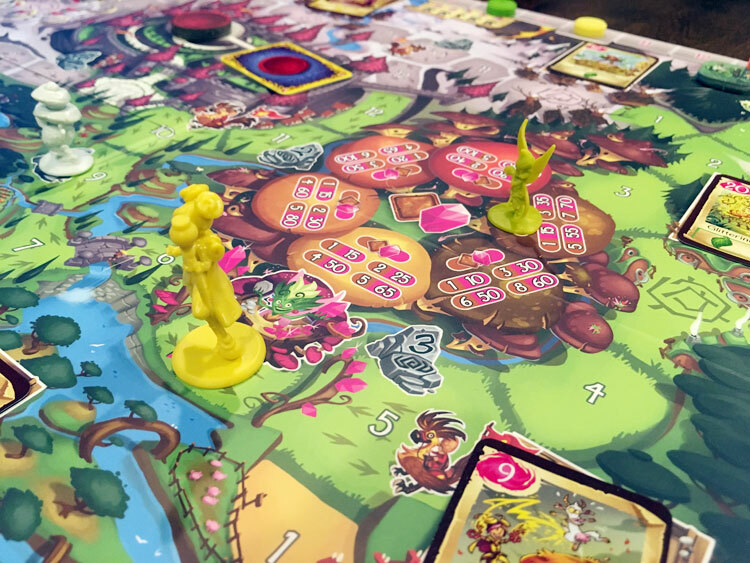 We review Wizards Wanted, a pick up and deliver game where players must manage their resources to complete the most jobs around the kingdom. Wizards Wanted is a beautifully illustrated game, but we let you know if the game play holds up. In software quality assurance testing, one of the most important concepts is to use the software in a way that doesn’t just test the most common scenarios, but also tests extreme scenarios. The software should work and present appropriate errors to guide the user even when they’re using it in a non-intended way. There should be nothing different about game testing. If a designer wants their game to perform just as well for “power gamers” as it does for the most common gamer, they need to undertake this form of testing. Gamers should remember this as this review proceeds. Mattel Games is stepping fully into the hobby gaming market with a new release. 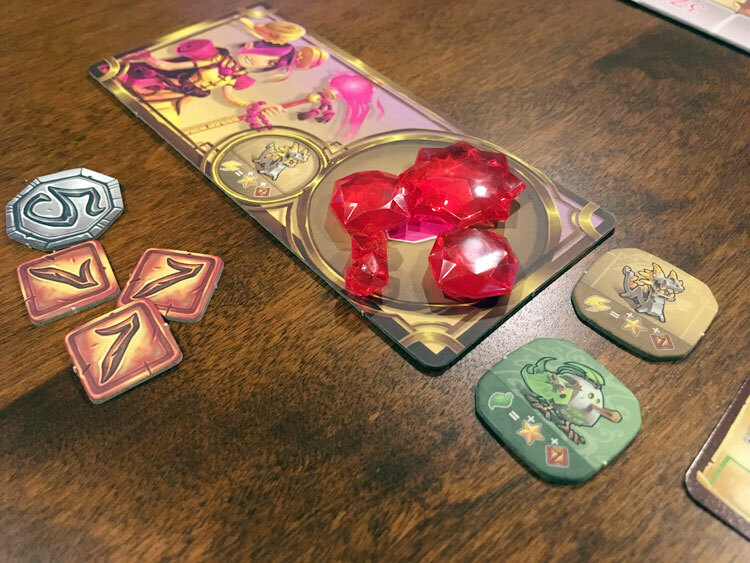 The concept is a game where traveling wizards complete jobs around the board for fame (points) and money (to buy pixie dust to power spells). The wizard with the most fame at the end wins the game. 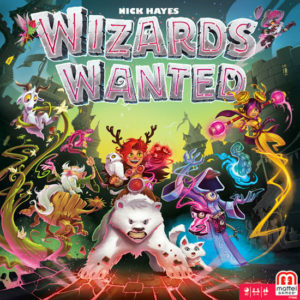 Wizards Wanted is a resource management, pickup and deliver style game for 2-4 players that takes about 30 minutes per player. It plays best with 4 players. The game includes very decorative player boards for holding pixie dust and reminding players which character they are. 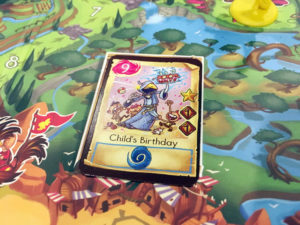 After a player moves, they can either: complete a job (spending pixie dust to receive fame and money), purchase pixie dust (from one of three vendors on the board), or visit the castle (the central space on the board). By visiting the castle, players can look at a series of objective cards (spell licenses) which provide end game bonus points. If they have fulfilled the requirements of the card, they can take it. At the end of the game, any player without one of these cards will lose fame points equal to the remaining cards’ negative values. Another component to the board is the dynamic nature of two mechanisms. Each time a player uses teleportation to move, a gnome character moves around the board providing a variable location to teleport to. In addition, each time a player buys pixie dust, the prices change for the next player. The art for the board is lavish and vibrant, really sparking the imagination. To put it plainly, Wizards Wanted is a tight, focused, and beautiful design that is drastically marred by insufficient playtesting. When played at casual, light and friendly speed, it’s fun. There’s lots to enjoy. But when players seriously compete and push the point generation mechanisms to the limit, the intentions of the game break and inferiorities emerge. As for components, the game board is overwhelmingly gorgeous. Mattel has set some star talent for illustration at work to create a cohesive and wonderfully detailed game world of pixies and friendly wizards. The paths on the board make sense and the goals map to the challenges effortlessly. The inclusion of player boards and perfect plastic pixie dust gem shapes rounds out the picture. Job cards show a huge variety of tasks, even some as mundane as would befit a sideshow magician. However, the real cross the game bears comes with miscalculation as to the variety of strategic opportunities and necessity of players to collect charms. Players will always want to perform spell jobs which match the charms they have. Once they collect enough of these charms, the bonuses from performing spell jobs outweigh any other point generation source. In addition, the most charmed-up players will purchase more pixie dust and be able to move farther and complete more jobs. It’s a cycle where the rich will get richer. In addition to this, the randomness of the spell job locations means only those players with enough pixie dust to move around the map at a faster pace will be able to have the flexibility to go to farther locations to complete jobs. Again, this reinforces the first issue. The only mitigating factor to the above is the number of players in the game. In this sense, the optimal number is 4, the highest player count. All this would not be such an issue if the cost of going to the central castle and looking at the end game bonuses was worth it. As it is, it’s slightly too expensive to divert from just completing more spells jobs. Even if a player ignores the rewards from the castle, the negative point punishment is not even close to being adequate to make the competitive decision interesting. It’s always worth it to complete more spell jobs than to do anything with the castle. Unfortunately, Wizards Wanted falls into the trap of many games whose target audience is under 12. There are product developers who assume that product testing with a target audience is enough and rigorous playtesting won’t reveal problems worth fixing. As beautiful and functionally well designed as Wizards Wanted is for pre-teens, it can’t escape inferior play with calculating adults. For this, it gets a mediocre rating. Final Score: 2.5 Stars – A fantastic concept and set of mechanisms is dreadfully weakened due to randomness and inadequate playtesting.